Geography is everywhere. 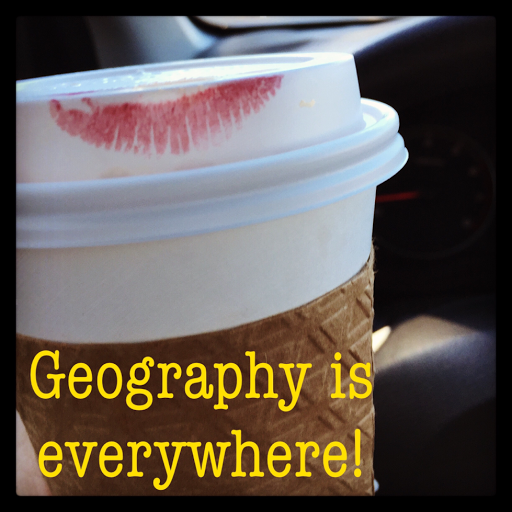 As we move further along in the semester, you will begin to see geography in your daily activities. It’s time to start capturing those activities…. How will you do that, you ask? You will take a weekly photo and write a reflection blog post on how it relates to World Geography. We have all ready talked about a number of things like the 5 themes of Geography, maps, different parts of the physical earth, etc. As we move through the rest of the class, it’s important that you start to see the geography all around you. We will be talking about population and migration or the movement of people, as well as, culture, political geography, industrialization and development, agriculture/food, rural and urban land use. You will have plenty of opportunities to see geography. Select one you want to write about. Create a blog post with the photo and the answers to the following questions. What is happening in the picture? Give us the context. Why did you take this photo? How is it related to geography? Which of the 5 themes of Geography does this photo connect with and how? Take a look at some of the student blogs #WG_SVH_PJP is the hashtag for the posts! When are they blog posts due? Weekly on Wednesdays starting Wednesday, February 23 – We will write the first two blog posts in class for bell work. Want to see an example I created? Here is another. 15 points per weekly blog post. Overview: What is happening in the picture? Give us the context. Why did you take this photo? A one paragraph summary of the photo. Summary paragraph: Be sure to answer the basic questions of who, what, when, where and why in your paragraph. Connection does not fit the photo or is only listed. Overview paragraph does not answer who, what, when, where or why. Or is not a paragraph just a couple sentences. Minimal sentence structure or spelling errors. Overview is a paragraph answering a few of the who, what, when, where and why. Overview is an in depth paragraph answering who, what, when, where, and why. Proper sentence structure and no spelling errors. Parts that Connect: How is it related to geography? Student makes connections from the photo to one of the 5 themes of geography or something we have studied in class. The connection is clearly explained. At least 1 paragraph. Connection is listed but not explained and loosely fits with the photo. Connections paragraph connects this article to one of the 5 themes of geography AND content we have studied in class but does not give examples or explain the connection. (Does not answer how it connects.) Shows a good correlation to between the connection and the photo. Connections paragraph clearly connects this article to one of the 5 themes of geography AND content we have studied in class by giving examples and explaining the connection. (How does it connect?) Shows a strong correlation to between the connection and the photo. What are some tips and tricks to help you out? Be sure to take more than one photo. The photo you intended to be the one for the blog post may not be the one that gives you the words you need to reflect. Take a few of different images of things going on throughout the week and select the photo when you are writing the post. Don’t wait to take your photo until Tuesday with the post being due on Wednesday. Let this be a thoughtful process. Blogger is suddenly missing from the iOS app store. This will at least help you get photos from your phone to a post. iOS users can also create a folder in Google Drive called Blog Photos and upload them to the Google Drive folder to add to your blog later.